On 23 rd September 2014 Dr. Marc Janoschek has received the Wolfram-Prandl-Prize 2014 of the “Komitee für Forschung mit Neutronen” during the “German Conference for Research with Synchrotron Radiation, Neutrons and Ion Beams at Large Facilities”. 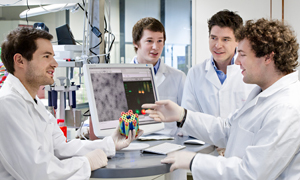 The prize is awarded every two years to outstanding young scientists and includes a cash prize of 2500 €. 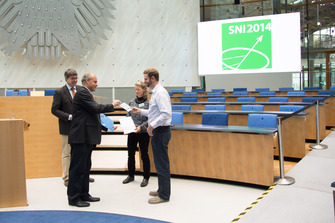 The winner has studied at the Technische Universität München (TUM) where he also received a PhD. He is now working at the Los Alamos National Laboratory in the United States. 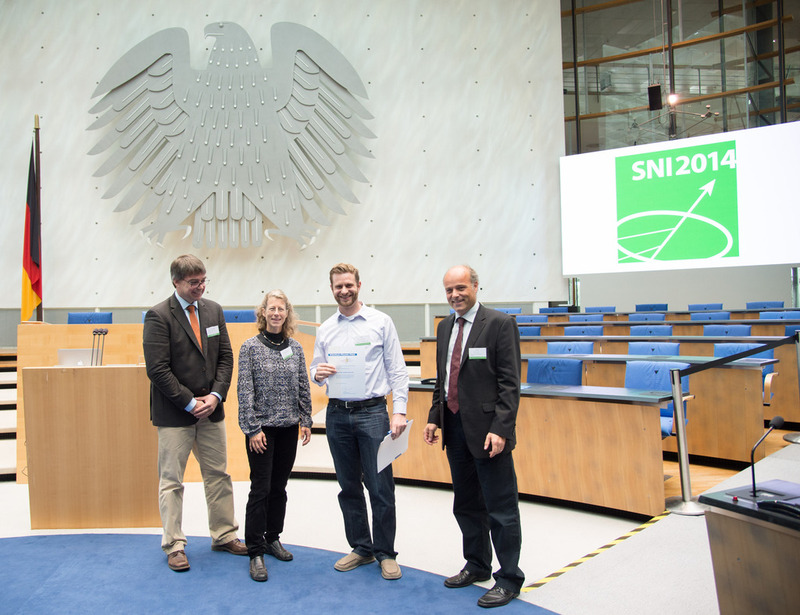 He received the prize for “his pioneering studies of the spin dynamics in chiral helimagnets and the development of a cryogen-free apparatus for spherical neutron polarimetry” as Professor Christian Pfleiderer (TUM) pointed out in his award presentation. 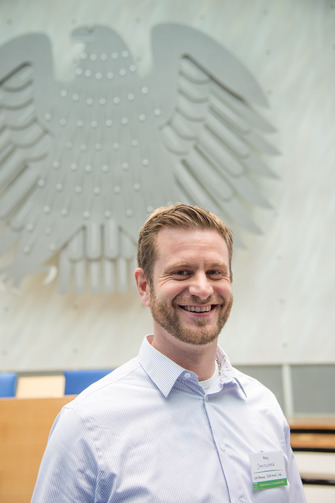 Janoschek not only has extensive experience with various neutron scattering methods, using different neutron sources all over the world. He also has himself developed, built and optimized new technical methods. 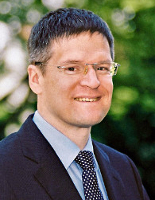 In an international cooperation between the neutron source Heinz Maier-Leibnitz (FRM II), the Paul Scherer Institute (PSI) and the Institute Laue Langevin (ILL) he developed a prototype of a module for the unambiguous determination of magnetic structures by means of spherical neutron polarimetry (Mu-PAD), which is now routinely used in various neutron centers. Already during graduation at TUM, Janoschek began with his studies of the spin dynamics of complex magnetic structures at the FRM II and PSI, which he finally finished in the last few years in close collaboration with theorists of the University of Cologne with a number of major publications of large interdisciplinary importance. He was able to demonstrate for the first time the universal character of spin waves in chiral helimagnets. Following a theoretical prediction from the 1970s, he identified the helimagnetic phase transition of chiral magnets as the first experimental example of a fluctuation-induced first-order phase transition, which is a contradiction in the classical sense. The winner early began to work internationally. He has performed parts of the experiments for his diploma and doctoral thesis at the ILL in Grenoble and at PSI in Switzerland. Shortly after passing with distinction his doctoral degree in 2009 a scholarship from the Alexander v. Humboldt Foundation permitted him to continue his research at the University of Southern California in San Diego, from where he moved after only two years to the position of junior research group leader at Los Alamos. 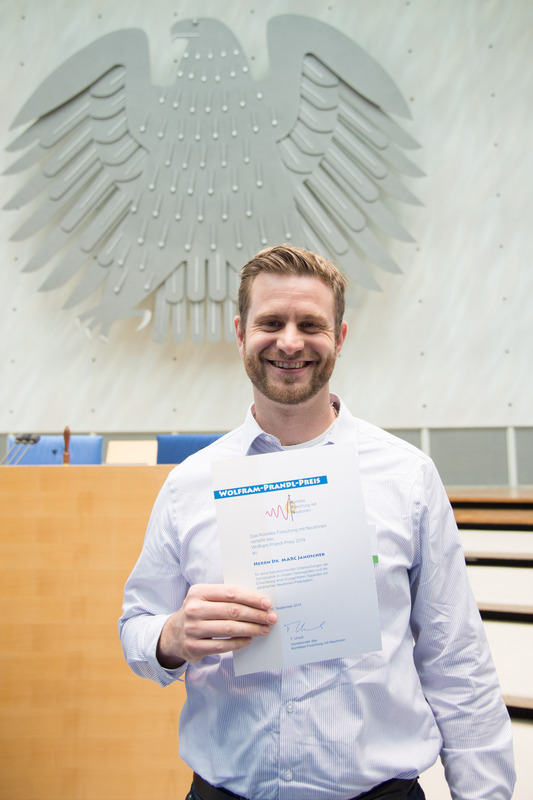 His scientific expertise and thoroughness is not only praised by his colleagues and supporters, it expressed itself in his “straightforward career”, as stated in the award presentation. 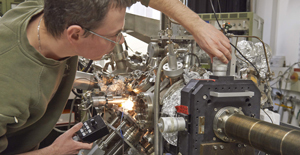 The prize is named after the physicist and crystallographer Wolfram Prandl, who built up an operating base of the crystallographic institute at the neutron research reactor in Munich and who was dedicated to magnetic structure determination. From 1976 Prandl was full professor at the University of Tübingen and a highly esteemed expert at many large scale facilities in Germany and abroad. 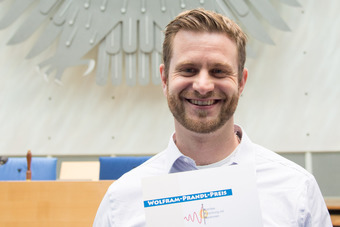 Since 2002 the Wolfram-Prandl-Prize is awarded every two years around the date of his death on 21 st September to excellent young researchers without a chair. Award ceremony of the Wolfram-Prandl-Prize 2014 at the SNI2014 conference in Bonn. 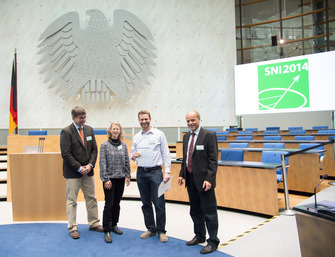 From left to right: Prof. Dr. Christian Pfleiderer (TUM), Dr. Karin Griewatsch (Uni Kiel, KFN), Dr. Marc Janoschek (Los Alamos National Laboratory), Prof. Dr. Tobias Unruh (FAU Erlangen-Nürnberg).